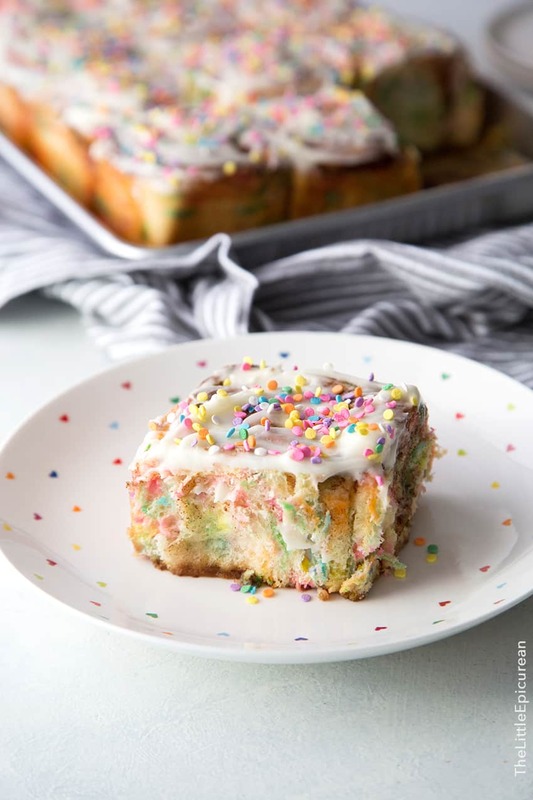 Funfetti cinnamon rolls frosted with sweet cream cheese. 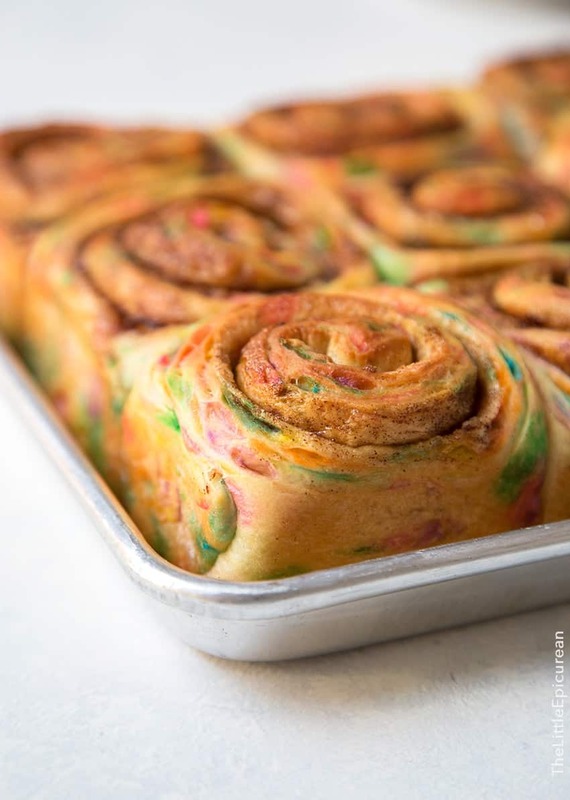 With the addition of colorful sprinkles, classic cinnamon rolls are elevated to a whole new level of fun and excitement. Within the past few years we have seen fried croissants, rainbow bagels, and over the top milkshakes. It’s time to put a fun spin on cinnamon rolls. Since it’s my birthday week, we’re adding sprinkles! 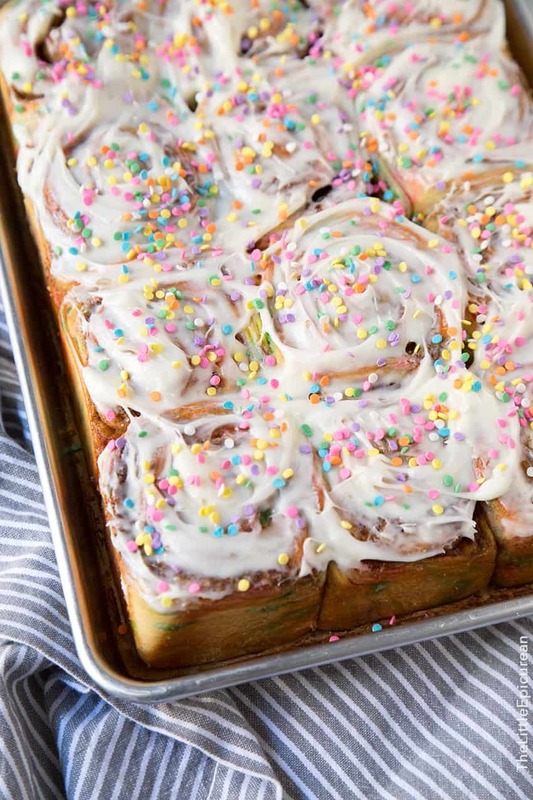 On the outside, these look like your average cinnamon rolls simply sprinkled with confetti on top. But once you grab a slice, you’ll notice the all the color hidden on the inside. Upon first meeting me, I’m rather quiet and introverted. It’s not until you spend one-on-one time with me that you’ll get to see the more bubbly, opinionated, and talkative side of me. 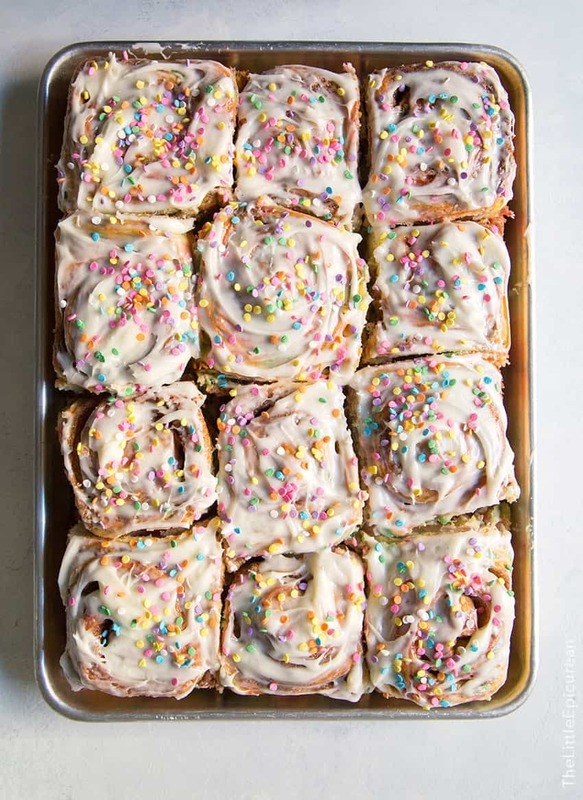 I think these funfetti cinnamon rolls are a great representation of who I am right now! 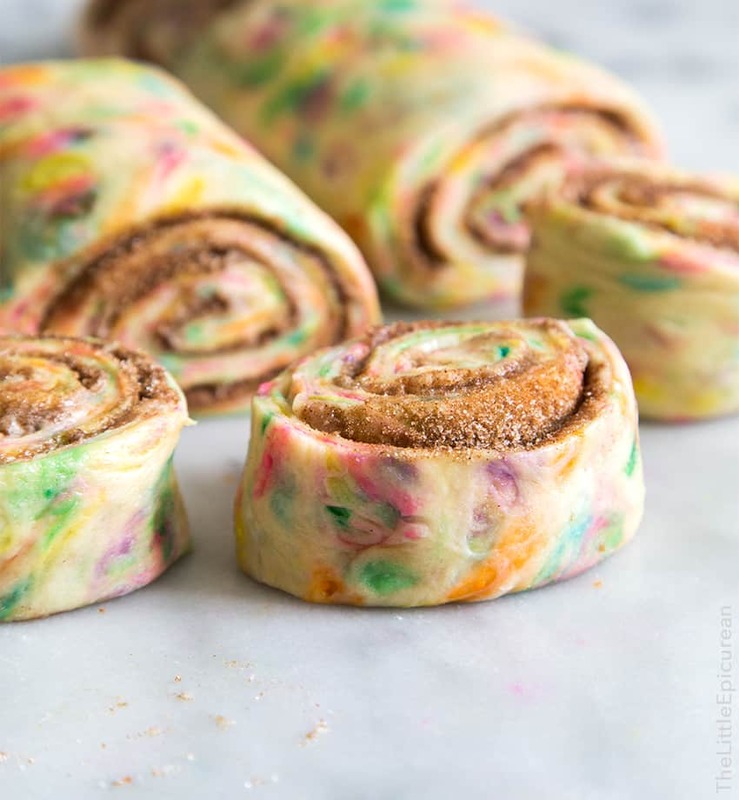 There are quite a few confetti/funfetti cinnamon rolls out there. Most of them add the sprinkles to the filling. I wanted to do something different. I added the sprinkles to the dough! And it turned out better than expected. Even after baking, the colors will still peak through the dough. All the drama and excitement is further heightened once you start slicing into the cinnamon rolls. Do it matter what kind of sprinkles you use? These “round sprinkles” will not work. There are tiny white balls coated with color. The color will rub off the dough and you will end up with strange crunchy bits in the baked rolls. Also known as “cylinder sprinkles.” These sprinkles are also coated with color. While they make dissolve a little slower than nonpareils, they’re still a bad choice. YES. These are the sprinkles you need. As the same suggests, these sprinkles look like round paper confetti. Sometimes they are called “confetti quins.” They come in all sorts of different confetti shapes: from traditional circles to flowers to stars and more. Cinnamon rolls have always been one of my favorite treats. In all honesty, if given the choice between cake or cinnamon rolls for my birthday, 80% of the time I’d pick the cinnamon rolls. From the way they smell baking in the oven to the natural smile that appears on my face after devouring a roll, cinnamon rolls bring me much joy. Plus, they’re the dessert that I enjoyed eating with my dad the most. 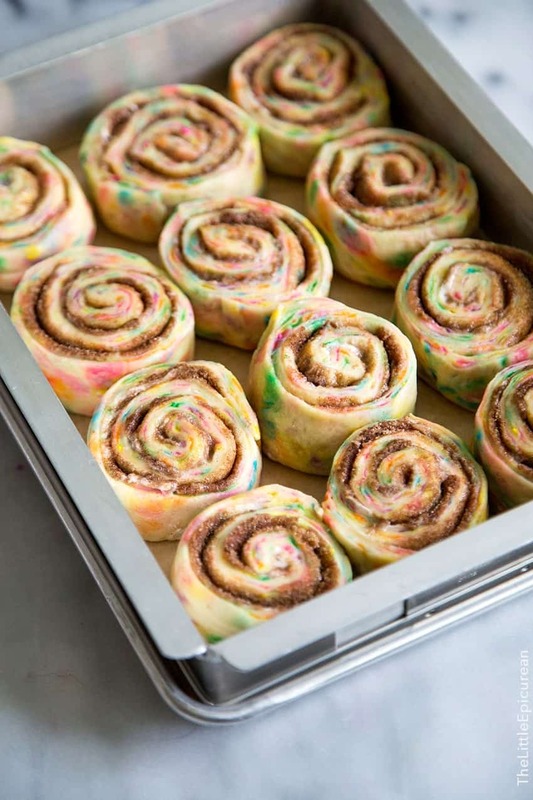 In a world where rainbow bagels exist, it’s only natural to have colorful funfetti cinnamon rolls as well! Dough: Sprinkle yeast over water and milk. Add 1 tablespoon sugar and stir to combine. Let sit for 5-7 minutes to allow mixture to bubble and active. In the bowl of a stand mixer, whisk together yeast mixture, remaining sugar, egg, and egg yolk. Whisk salt into flour. Add 2 cups of flour to mixing bowl. Use the dough hook attachment to mix together. Add another 1 cup of flour. Continue to knead on low speed, add softened butter 1 tablespoon at a time. Add remaining cup of flour and knead until the dough is smooth and cleans the sides of the bowl. 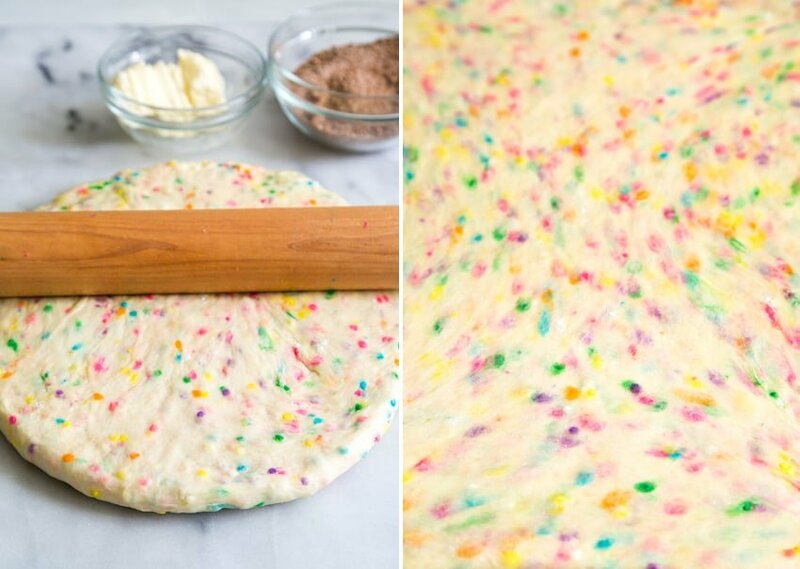 Add confetti sprinkles and mix until evenly distributed in the dough. Transfer dough to a lightly greased bowl. Cover with plastic wrap and let dough rest at room temperature for about an hour until double has doubled in volume. Punch down risen dough. Transfer to a lightly floured working surface. Roll dough into a 20 x 14-inch rectangle. Spread 1/3 cup softened butter over dough. Cinnamon Sugar Filling: In a bowl, mix together sugar, brown sugar, and cinnamon. Distribute cinnamon sugar filling and gently press into dough. Sprinkle sea salt. Roll dough into a log, starting at the longer side. Slice the log into 12 equal parts. Place rolls in a greased 9 x 12-inch baking pan. Cover with plastic wrap and let rolls rest for 30-45 minutes at room temperature to allow rolls to rise. Preheat oven to 350°F. Remove plastic wrap and bake rolls for 30-35 minutes until golden brown on top and the internal temperature of the rolls hit 185°F. Allow rolls to rest for 5 minutes to slightly cool. Cream Cheese Frosting: Beat together cream and butter until smooth. Add sifted powdered sugar and beat until smooth and thickened. Spread over warm cinnamon rolls. Top rolls with additional confetti sprinkles, if desired. 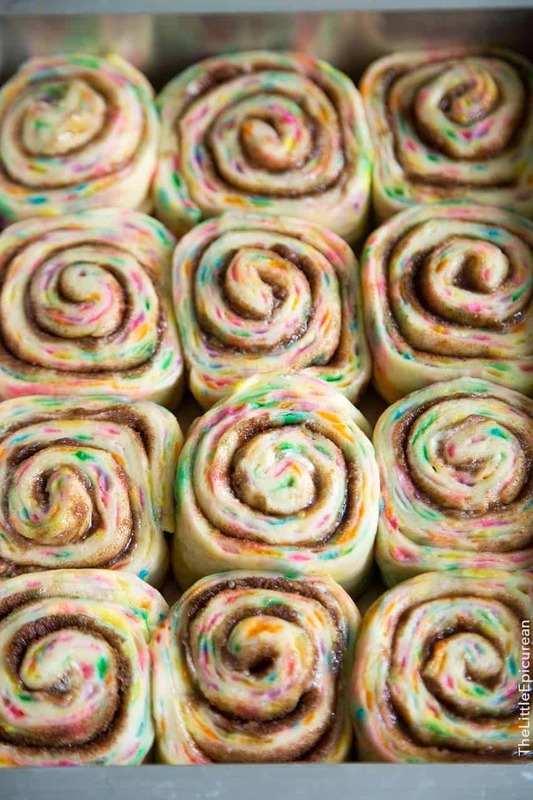 Funfetti cinnamon rolls are just so pretty! I think putting sprinkles into dough needs to happen more often. 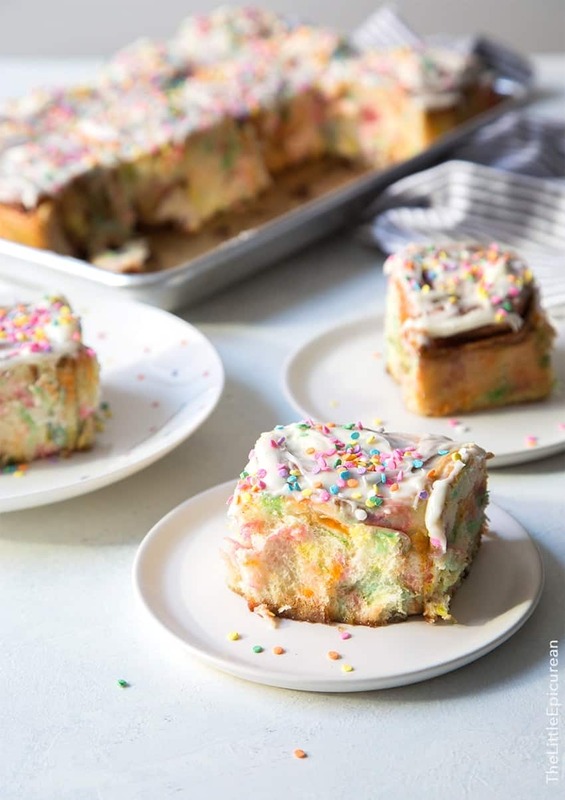 Funfetti cinnamon rolls?!? My dream life! All your recipes are incredible, and this one doesn’t disappoint! I’m totally making these for my daughter’s birthday breakfast!! These are so fun, and so festive. Perfect for any type of celebration, or for a great start for a typical Monday work or school day to make it start off with a bang. These are SO cute! And I’m obsessing over that adorable plate too! Happy birthday week! I need to make these for my son’s birthday feast! These look so pretty and mouth watering! I want to make them for breakfast on my husband’s birthday. Do you think I could do any of it the night before? Yes, you can prepare the dough the night before. Follow the directions up to placing the cut rolls in the baking pan. Cover with plastic wrap and let chill in the fridge overnight. The following morning, allow rolls to come to room temperature (30 minutes or so) and then bake as directed. Can I sub coconut milk instead of whole milk? I have not tested it with coconut milk. If you give it a try, please let me know how it goes! Am I the only one who can’t get the yeast to activate? Tried twice..what am I doing wrong? The liquid the yeast is hydrated in should be warm, but not hot. Yeast activates between 90 – 115 degrees F, anything hotter and the yeast may die. Also, if the liquid is too cold, the yeast will not activate. These are adorable. I love that they’re homemade. Made these this weekend! So great. Thanks for the recipe idea. They were a big hit. That’s wonderful to hear! Glad you enjoyed it! You can make the dough overnight and bake it the follow morning. If you leave the dough in the fridge for more than one day it will deflate. Yes, yes, oh, and yes. How did I miss this? This is everything to me. It’s a sheet full of rainbow happiness in my opinion. Definitely adding to the to-do list…! I love all things funfetti! I’ll have to make you and Christine a batch next time we have coffee! Wow, this looks amazing! That’s triple the amount of frosting I would use. Gag. These are SO cute! All your recipes are incredible. Thank you! LOVE THESE! but any idea on how to cut the recipe to 6 considering it only uses 1 egg? I tried this in my bread machine on the dough setting and my dough came out grey not confetti. Do you think the type of sprinkles matters? Hi. Love the article and the recipe! Any ideas for making in advance/freezing? I saw this recipe shared on A Beautiful Mess and just had to come here to pin it. Can’t wait to make these for my kiddos. They will love them!